Also, caught a whale. Dure spent about $3000 in less than a month. I don't like particularly whales. They are unpredictable and weight to much in the total revenues. rather have 10 x $10 come per day than 1 x $200, makes me more comfortable, I'm sure a lot of you can relate. Yeah but the fact is most people on chaturbate dont spend money and the most affiliate earnings comes from a few whales. Can you share which landing you use ? Highest Streamer ? Main website or something else? "Hey guys, just a heads up. I'm back to my normal signup number it seems. Deleted the unique tracking ID - seems like my trackers were too long." Do you mean that the tracking code was too long? Which is the maximum lenght? I'm using revshare on Chaturbate & driving trafic through social (don't ask me, please). Hey guys, i really need your advice. I am currently earning with cpa. And my earnings are good. My traffic only comes from a single source (1000+ hits per day and i can't share it), so would it be a nice idea to give "chaturbate" a try? And forget about my cpa for a whole lot of time? You can do A/B testing to just switch to Chaturbate for a few days. Numbers of free reg will tell you if it's profitable. I personally convert about 1:70 free user into a paying user. I convert 1 in every 67 free users. I'm planning on posting more of these babies chart to understand the psychology and what you can expect from your regs. 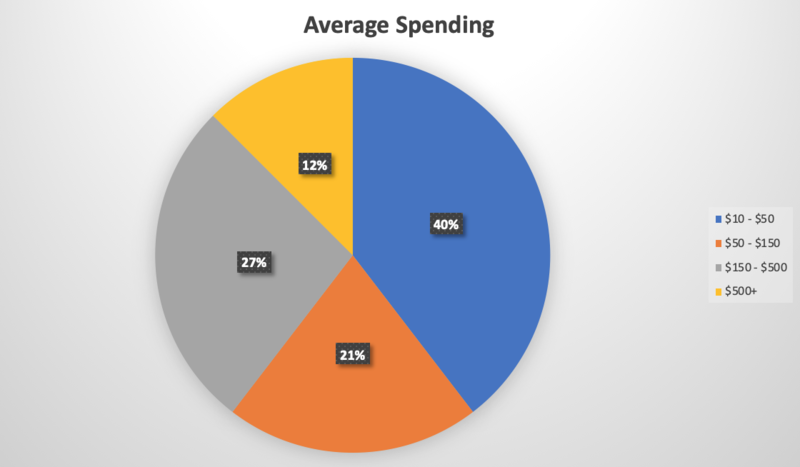 As you can see, most users will spend on the same day as registration and spend only a few bucks. You have 12% chance of catching a whale ($500+ spent). Which in my case will happen once every 558 registrations. So I started doing this free reg stuff for fun since TayaX posted his journey. I got 827 free regs from feb 22nd-feb28th. I was disappointed because I didn't see 1 spender. So I decided to let my account sit for the first half of march. I logged on today to see if I had any results at all. I had 2 spenders of around 180 dollars and made 35 dollars so far. My traffic must not be as good as TayaX but I must say im pleased to see some action on my account lol. Yeah I figured, its not the greatest traffic, but its like 10 dollars for like 3-5k hits so its gonna be worth it in the end. So ill just keep going. I heard chaturbate might banned though if traffic isn't converting. I think this might only take place if im using PPL. I don't think they care if they are getting traffic to a revshare. Just my opinion I don't know for sure. OP do you do anything to ensure your targeting T1 spenders? or do you just gain mass sign ups and hope? how much SEO have u done to it? is there some SEO u can recommend? PS: Please don't P.M. with question that would good for public knowledge - I won't share anything in private that I wouldn't in public. Also, I won't answer about source of trafic or method I use. I worked hard for it, I'm willing to enjoy it with very few competition.